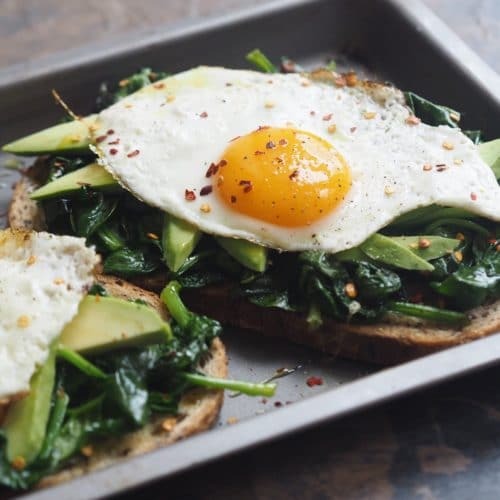 Try this Loaded Toast Recipe to upgrade your breakfast today! Heat the oven to 180C. Place bread slices on a baking sheet. Brush top sides of bread with olive oil. Season with salt and pepper. Broil until golden, approximately 2 minutes. In a large nonstick skillet, heat olive oil over medium heat. Add spinach and sauté until cooked and wilted. Turn off heat and mix in goat cheese and diced avocado. Top each slice of toast with equal amounts of the spinach/avocado/goat cheese mixture. Heat remaining of oil over medium heat. Crack eggs into skillet; season with pepper. Cook until whites are almost set, about 1 minute. Cover, and remove from heat; let stand until whites are set but yolks are still soft, about 3 minutes. Top each toast with a cooked egg.